In ‘1826 Peter Dillon was captain and owner of a ship named the St. Patrick. On a voyage from New Zealand to Bengal, he anchored off the island of Tikopia ( Santa Cruz Islands) on May 13, 1826. ( Dillion had dropped Bushart, his wife, and a lascar off at Tikopia Island on September 20, 1813). Dillon did not discover La Perouse wreck: (Prussian, Buchart) Martin Bushart and the lascar came on board, the lascar with a silver guard from a sword. This guard, together with several iron bolts and chain plates from a ship, axes, knives, china, and glass beads, all of French manufacture, were in the possession of the Tikopians who stated that they came from Malicolo (Mannicolo, or Vanikoro), where two large ships had been wrecked. 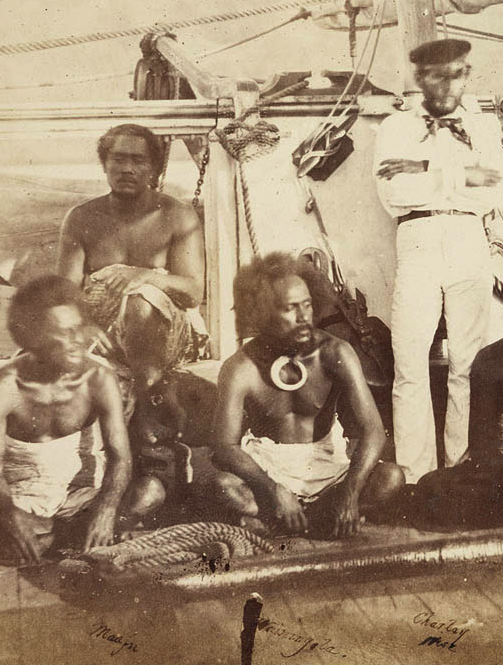 Dillon took Bushart and a Tikopian on board to visit Vanikoro, which was ordinarily two days sail, but Dillon abandoned the search after being becalmed for seven days. He reached Bengal on August 30. Captain Dillon entered into correspondence with the Bengal Government, urging that a search expedition be placed under his command, and he also brought the matter up before a meeting of the Asiatic Society’.